EDIT: This pattern was updated on December 21, 2009. The pattern as written now, uses a larger hook size (to solve the stiffness problem) and includes tips for changing colors and carrying loose ends as you work so that you will have only ONE loose end to tuck in after you complete your scarf. This pattern is intended for people with experience and lots of patience as a lot of color changes are required. This pattern is not recommended for beginners. Please read this pattern fully and carefully before beginning. You will be required to repeat certain rows to obtain the piano key layout. Be sure to only repeat the rows indicated when instructed to. The piano key scarf is perfect for any piano lover. Take the piano anywhere and everywhere you go. This crocheted scarf is great for men, boys, ladies and girls. No matter who you are, this scarf is bound to keep you warm and fashionably in style. Just whip out your yarn and crochet hook and follow the crochet pattern below. For this pattern, when you are instructed to change colors, make one chain with the color you are currently using, then cut the yarn and pull the loop on your hook so that the loose strand of yarn is pulled through the stitch. Pull the loose strand so that it creates a small knot. Your loose end should not be longer than 2 inches. With the new color, start with a slip knot on your hook, then make the stitches as indicated in the pattern. Carry the loose end of your yarns as indicated in the tips in the pattern. The knot made should not be noticed in your work. Tip: before making your last few stitches on this row, hold the loose end created at the beginning of the chain, to the chain and crochet over it. All stitches now and throughout are worked in the front loop only. Tip: Carry the loose ends of the white and black yarn in your work until it is no longer sticking out. Tip: When crochet with white yarn at the beginning of row, carry the loose ends of the black and white yarn in your work until it is no longer sticking out. When you change to black, carry only the loose end of the black yarn in your work. Tip: Carry the loose ends of the white and black yarn in your work until it is no longer sticking out. When you reach the loose end of the white yarn from the previous row, carry it in your work until it is no longer sticking out. Work “One Key” (rows 3 – 6), 2 more times. Tip: Carry the loose ends of the white and black yarn in your work until it is no longer sticking out. Before making your last few stitches on this row, hold the loose ends of the black and white yarn from the previous row, to your work and crochet over it. Work “One Key” (rows 3 – 6), 2 times. Work “Space” (rows 7 – 10), 1 time. Work “One Key” (rows 3 – 6), 3 times. Repeat the above 4 lines until the scarf is as long as you desire. When you choose to end your scarf, end after you compete your last row 7. You should only have 1 loose end to weave in when you are done. For an extra perk, add black tassels on both ends of the scarf. 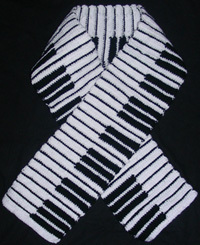 Do you need help crocheting the piano key scarf? No worries just leave a comment! This entry was posted on Monday, February 16th, 2009 at 8:06 PM by Rachel Choi	and is filed under Best Crochet Patterns, Free Crochet Patterns. You can follow any responses to this entry through the RSS 2.0 feed. You can leave a response, or trackback from your own site. I really love this pattern and have just started making it. I’ve not attempted anything with colour changes before, but am managing to do it ok, as your instructions are excellent. However, as my scarf is going to be for a man, I think I’d have preferred it to be a bit wider. I was wondering about doing a couple of rows of sc around it afterwards, in black yarn, but am worried if I do it as a black border, then the piano keys might not show up. Hi Sheila! I think the keys will still show up after you do the black border. Give it a try and see if you like it. You can always undo the border if it doesn’t look right. Can I suggest a different colour for the border? Maybe red, or yellow, or green – or whatever suits the person? Draw out the piano on paper and photocopy. Use coloured pencils and try different colours to edge it. I have started this piano scarf a couple times but I keep running into the same problem. On the first color change on the keys I end up having a hole between the white and black. I’m not sure what I am doing wrong. Thanks! Hi Jeanne! It is normal for a small gap to be between the two stitches. After you work the next row on top of it, it will hold the stitches together.